Keeping with the splendor of our beautiful state, we have preserved a natural setting for our guests in combination with modern amenities and convenience. This campground was everything we wanted in a mountain vacation trip! Felt like we were in the mountains but still close to all the sites to see! Quiet, clean, campsites littlerally on the side of the mountain with different levels/elevations of campsites. Easily navigable within the campground, walking can be strenuous with inclines but we loved it. Stayed on 2nd level from top. Very cute and well maintained. Staff unhooks water hoses at night when freezing, huge help! Very accommodating. We will be back for a summer stay at the top! The campsites were awesome. We were on top of the mountain....breathtaking views. Nice firepit. Restrooms, showers super clean! Office and staff very nice and accommodating, with most general necessities available in the general store. We will definitely return!! Beautiful mountain views from the top sites of this campground. Many things to see including The Biltmore, Chimney Rock, Blue Ridge Parkway, Black Mountain, Asheville. Sites are gravel, long and include a picnic table and fire pit. About 20' between rigs, however you are angled so everyone has the breathtaking views and it feels farther apart. Bathrooms are modern and spotless...cleanest I have ever seen. Nice areas for dogs. Wi-fi is good, but unsecured. Staff is friendly and very helpful. Wonderful place to stay. I will be back. This is a wonderful place to park your RV for a quiet stay. The sites are well thought out and level. However, it lacks the "campground" feel due to the steep hills. You cannot walk around without considerable effort, and there are few amenities. This does keep the campground relatively quiet. We also found that the Wifi did not work most times of day. The bathrooms were exceptionally large and clean. The staff was nice and helpful. This is a lovely park that has tiered levels to stay. We stayed at the top level and the only negative thing I could say is it's a little scary making some of the turns to get to the top, but once you are there the views are spectacular. The site was level and wide enough for us to park the tow car beside the coach. The ground are well maintained and the restrooms are modern and very clean. Staff was super friendly and even hand delivered several packages to us. We stayed here in a 40 foot MH and would definitely return. This was our second summer stay at Mama Gertie's and both visits were exceptional. All the great reviews you read are indeed the "real deal". The campground is absolutely beautiful with great landscaping and spectacular views. It is very quiet, peaceful, and relaxing. You don't even want to leave each day to go do other things in the area. All facilities are well maintained. Bathrooms, showers, laundry areas are always spotless. Also, they have a game room and small gym. The on site store is nice and adequately stocked. The only thing we would like to see that is not there is to have some nice playground equipment installed for kids. Yet, kids always seem to be very happy regardless!.This is a great base camp to do everything in Asheville, western NC or even into eastern TN. Day trips are a breeze to anywhere you want to go. The two primary staff members with whom we have dealt are everything guests should want in a host. They are both friendly, good natured, welcoming, inclusive, and responsive. Everything you need in terms of a grocery store, pharmacy, restaurants, etc. is just down the hill across the I-40 bridge. Restaurants in Black Mountain are only 5-10 minutes away. Finally, I will say that in our 2 trips here (which has covered about about 21 nights), we are amazed at the clientele at the campground - everyone is very friendly, quiet, and totally respectful towards each other and the campground premises itself. Just an awesome place. This park is amazing. The sites are immaculate, the shower and laundry facilities well supplied and clean and the staff is very helpful and friendly. 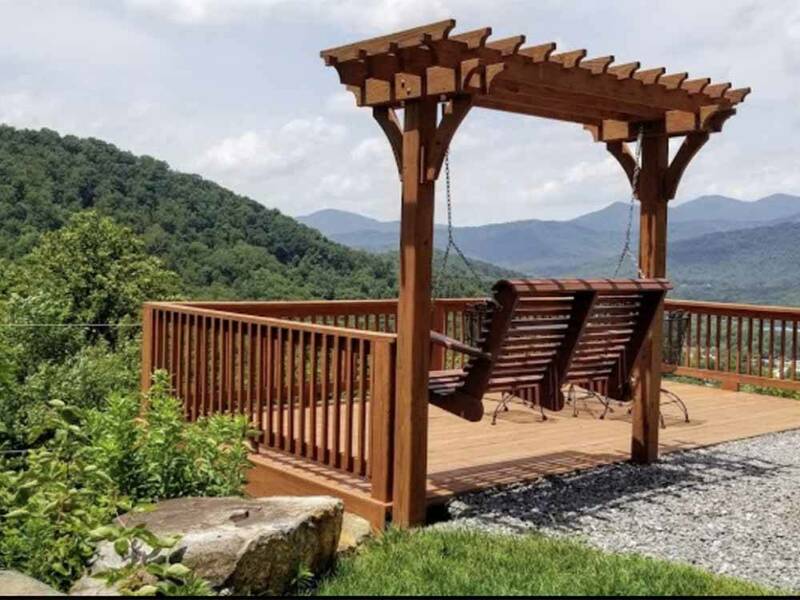 We stayed in one of the mountain top views with a deck that included a wooden swing, picnic table and grill. The deck was built into the side of the hill so the back of it was literally 20 feet off the ground. The view was amazing and totally worth the effort it took to get to the top site. The mountain sites are hard to reach, but the staff members are expert at escorting you up the hill. They even convinced us not to unhook our tow knowing exactly how much space we would need to make the turns up the hill. 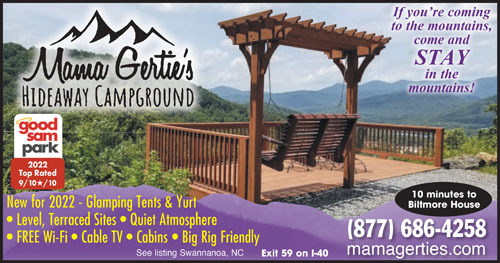 I strongly recommend this RV park if you are looking for that special place to enjoy the glorious mountains near Asheville. You will not be disappointed! Breath taking views and perfectly maintained sites. WiFi was fast and the cable worked great. It was only my husband and I this trip, not sure our daughter would like it. There is not a pool or playground for her but it is the perfect place for a weekend get away! We will definitely be back!! This was our second stay here but first time in our motorhome. Excellent park overall. Helpful staff - loved that they guide you into your site! Impeccably clean restrooms, showers, and laundry area. Sites were well maintained. Close to Asheville, Blue Ridge Pkwy, Black Mtn, and Chimney Rock areas. Park goes up the side of the mtn so be prepared for some hikes up and down but that's why you stay in the mountains! The staff will always give you a ride up to your site if needed. Don't miss this one! Here is a park that I don't Good Sam gave a high enough rating. We stayed in a mountain view site way up the mountain. The site was huge with a great view. All utilities worked great including the wifi. Staff is helpful. Only issue I can mention is that they let people with too many dogs here. We saw as many as 4 dogs in one RV. This was our second winter stay, stayed in a mid-level, back in site. Cannot wait to go back this summer and stay on a "mountain view" site. Staff is friendly and cannot do enough for you. They went out of their way to ensure we were informed and prepared for any winter weather conditions. We have a 5 year old and this is by far his favorite adventure destination. Laundry and bathrooms immaculate, grounds well maintained. Office Staff is very helpful, also assisted in picking a site with a small yard for when we go up the mountain later this year. Everyone we had contact with was friendly, helpful and professional. From reservation to check in and out, they made the process easy. We look forward to staying many more times. We have told other friends "Not to miss MaMa Gerties". Great place to stay, close to Biltmore, great owners with outstanding park in the mountains. Will come back in the summer to enjoy all the great views from the top of the camp ground. Very friendly. Clean excellent amenities. Fast internet. Beautiful atmosphere. Excellent location for visiting Asheville. While I was making the reservation, the manager moved us to a larger site that would be better suited for our 32' FW. Backed-in terraced sites have views of the mtns and valleys. With the leaves on the road my truck was challenged going up and spun the tires once or twice. The manager was very helpful when we asked for specific "types" of restaurants (Italian, etc.) If ever passing through again, would stay here in a heartbeat! Out of all the campgrounds we utilized during our three week vacation this summer, Mama Gertie's Hideaway was by far the best. The campground is cut and terraced out of the side of a mountain. The drive to and from your campsite, if on one of the higher levels, can be intimidating on first blush, but really quite easy to navigate. The young lady at the office was very friendly and helpful upon check in and told us that a coworker would guide us to our site. Sure enough, a young man was waiting for us in a golf cart. I had never been escorted to a campsite before and didn't understand why until we began the journey to our site located on the second to highest terrace of the campground. Immediately upon leaving the office area, we began a climb that I estimated to be something like 20 degrees or more. It felt like we were driving nearly straight up. We reached the first level and straightened out for a short period, and then began a second climb to our level. The young man not only pointed out our site, but got out of his cart and directed me while backing into the site so we were perfectly straight and centered. I must say the customer service at this campground is exemplary. The site is gravel but is bordered with landscaping bricks, which the young man immediately began trimming with a string trimmer to ensure a clean look. The site was nearly perfectly level and came with a picnic table and medium tall evergreens on each side to provide privacy from your neighbors. The back of the site had large boulders to avoid you accidentally backing off or falling off your site to the level below. The view was outstanding and all the campsites on lower levels were visible. Mama Gertie's offers weekly and monthly rates that are quite reasonable. My wife and I are seriously considering staying there on a monthly rate in the future. I am afraid I cannot comment on the facilities since we never used them. But the office building appears quite new and after speaking to other campers, I was given the impression that the facilities are well kept and very clean. I highly recommend Mama Gertie's and we will return.